The index opened flat to positive and stayed in a narrow range with huge volatility to close weak just below the psychological level of 8700 at 8699.95, loss of 12.10 points. The broader market was also weak, with 545 advances to 959 declines. Developing Range as per Option Table comes at 8400-9000. Call option 8800-9100 added huge 12.53 lacs OI with profit booking seen at 9200 and above strike prices. 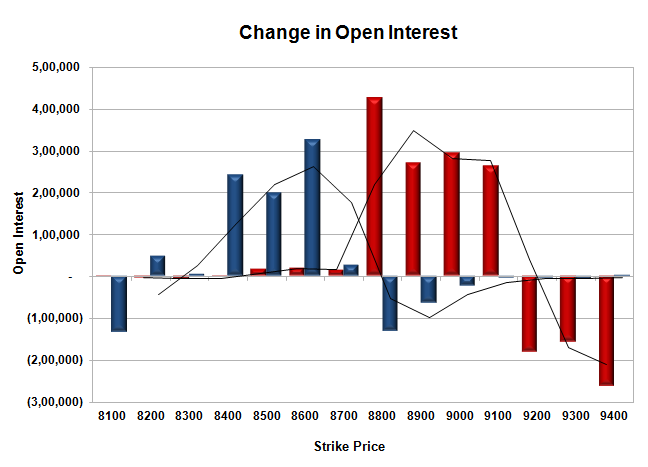 Put option 8700-8400 added huge 7.95 lacs OI with huge short covering seen at 8800 and above strike prices. 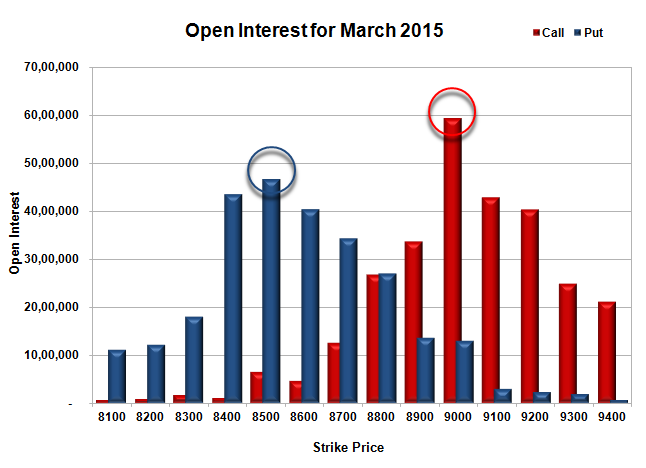 Nifty Open Interest is at 2,49,09,700 up by 98,275, with decrease in price, most probably short build-up. Bank Nifty Open Interest is at 22,95,725 up by 87,375, with increase in price, most probably long build-up. FII’s bought 3.39 lacs Futures, which includes 7594 contracts long build-up and 5971 contracts short covering, with increase in net OI by 1623 contracts (includes 61318 longs to 47753 shorts for the day) and the Average Price comes to 8839.94. FII’s Index future open contract as on date is 796594 Longs to 120625 Shorts, net long 675969 up by 13565 contracts. Initial support still at 8700, with OI of 34.41 lacs and below that at 8500 with huge OI of 46.69 lacs. Initial resistance at 8900, with huge OI of 33.62 lacs and above that at 9000 with highest OI of 59.30 lacs. 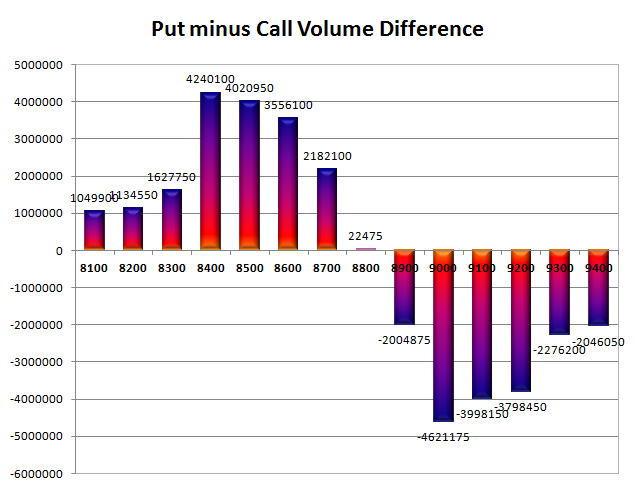 Day Range as per Option Table is 8622 - 8799 and as per VIX is 8631 - 8769 with 8713 as the Pivot.